Please support the teams who started their fundraising pages displayed with links below. - Barley Hill School Thame's - 4 Teams - Barley Hill Barracudas, Team Haste, Fantastic Five, Zoomy Zebras. These 4 wonderful teams of children (and a few adults!) from Barley Hill Primary School are going to be swimming as many lengths as they possibly can to raise money for Barley Hill School PTFA and the Thame Rotary Charities. - Wheatley Park School Interact Club - A group of 4 Interact students will be swimming for 1 hour. 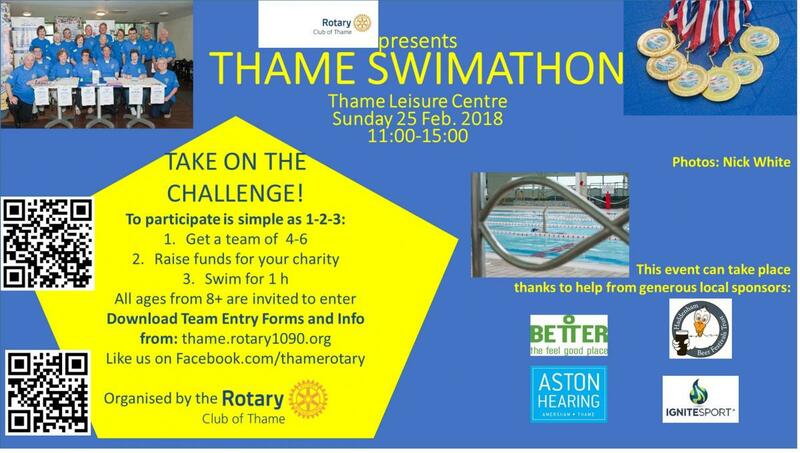 Other Wheatley Park interactors will be volunteering at the Thame Swimathon by counting the lengths swum by other teams. The main local charity, which will be supported from the money raised, is SeeSaw. This charity is set up to meet the needs of bereaved children and young people and it it based in Oxfordshire. - SeeSaw - an Oxfordshire based charity set up to meet the needs of bereaved children and young people in Oxfordshire.